When we purchased our home in 2008 the housing market was in decline and most everything we looked at in our price range was a foreclosure. Many of them smelt bad, were missing pipes, and were full of garbage. It was difficult to see the diamonds in the rough. We ended up in a 1991 split foyer that was clean, had no foul odors, and was for sale by an actual family. Since then, we have been updating our terribly out of date home. 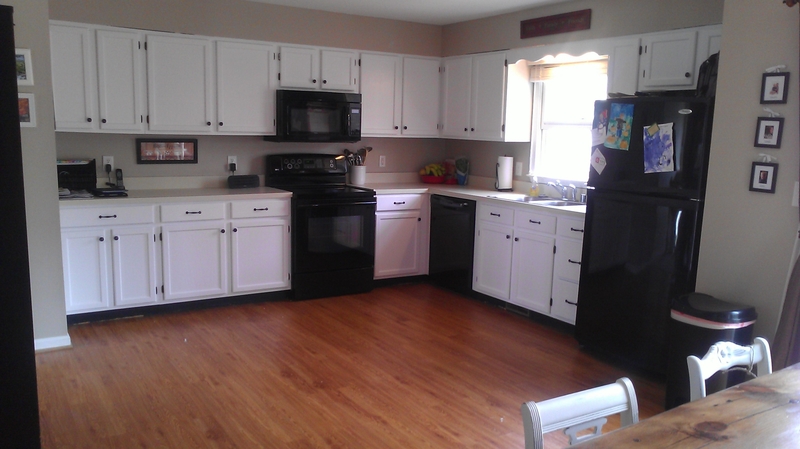 Flooring, bathrooms, HVAC, fixtures, front porch, and paint colors. The kitchen was a sore spot for us. Very expensive to change and as home prices continued to fall, a $10K investment just didn’t make sense. 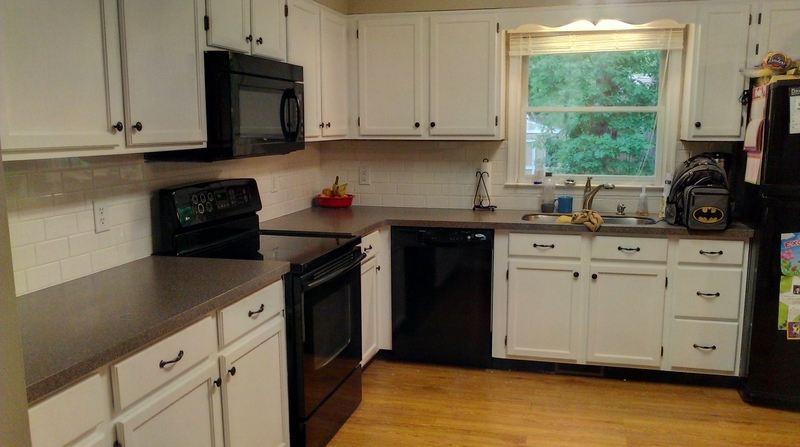 When we purchased our home we replaced the original appliances immediately. Then we promptly painted the mint green walls. This is what were were left with. Not terrible, right? I almost forgot a before snap shot, thus the missing doors. I loathed the builders grade cabinets. 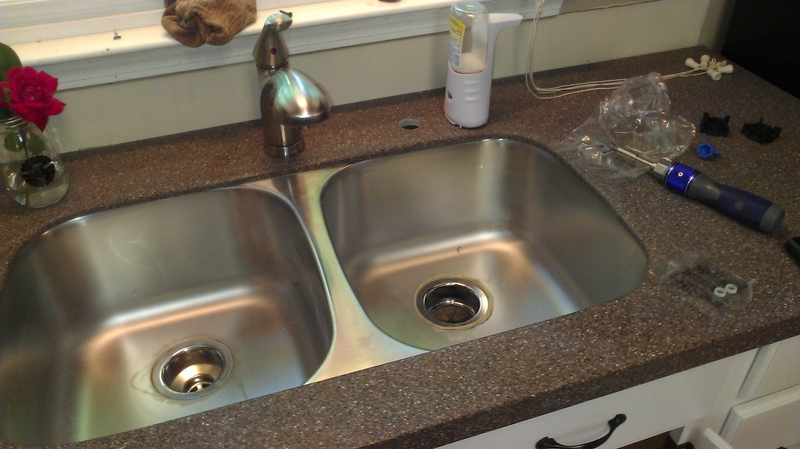 Not to mention, the stained up beige laminate counter-tops. For years we waited to take advantage of the yearly IKEA 20% off sale. The last 3 years we talked ourselves out of it every time!! I so badly wanted a new kitchen, but even at the cheaper IKEA price, we couldn’t take the plunge. There has to be a better, cheaper, faster way to achieve an updated kitchen without spending $7000! So I had this crazy idea that I could paint the ugly fake oak. I googled, I read, and then I went to Lowe’s. First let me say that what we did took time, energy, and was messy. It was hard. Half way through, I wanted to quit. Before we went nuts, I tried one door. If it looked terrible, we would just gut the kitchen and spend the money on a new kitchen that we would never get back out! Not bad. Terrible process though. Here is what I did with the help of my husband. 1. Degrease and do a good job. 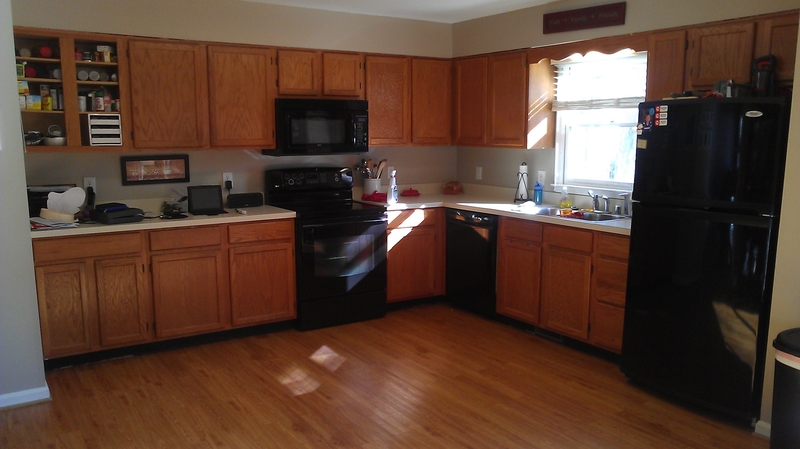 The older the cabinets are the more you will need to clean. Articles I read suggested TSP, but you can use Grease Lightening or anything else that will remove the grime. 2. Sand with fine grit sandpaper. This is messy, I suggest doing it outside. 3. Wash them down again with a wet sponge and let dry. 4. Use a Tack cloth to remove the remaining dust. 5. Ready for fun? 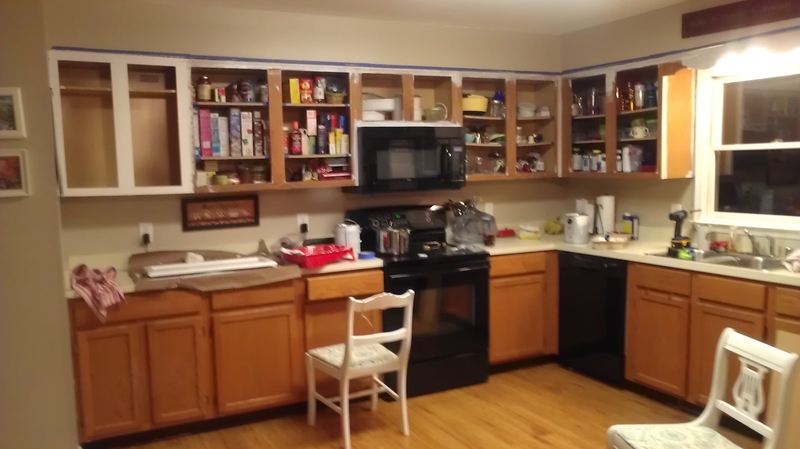 Cover the cabinets with an Oil Based Primer, I used KILZ. This is painstaking. You have to do one side of each door at a time. 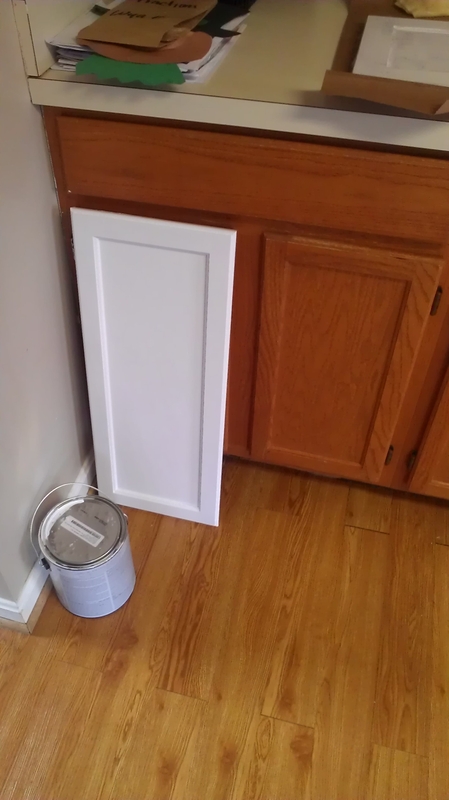 Then it has to dry completely before you add a second coat…yes you will need a second coat of primer. It’s sticky and very difficult to keep up with pooling in the corners. Use a polyester brush BTW. In fact, buy a few. Also, you will only want to brush the corners and sides, roll the rest. Hardware stores have smaller foam rollers just for this. Buy extra rollers because trust me when I say you won’t want to clean them and reuse them. 6. We did all the top cabinets first, then the top frames so that we could slowly put the kitchen back together and not mix up the doors. After the 2 coats of primer are dry, it’s time to paint! Pick your color, and use ACRYLIC ENAMEL paint. We chose ultra white. This is a pain staking process. Two coats are needed. Even with all of my extra coats, we only used a gallon of each (KILZ and paint). You need to do just like you did with the primer, brush the corners, then roll everything else. Here are some photos I took during the process. I tried to do all of this in our garage, but with 3 kids running around, I ended up putting paper down in the kitchen floor. By the way. when you have finished one side and it’s dry and you flip it over to paint the other side, the paint on the down side will stick to whatever you lay it on. I ended up using whatever I could find to lift it, sponges, folded dish towels, ect. 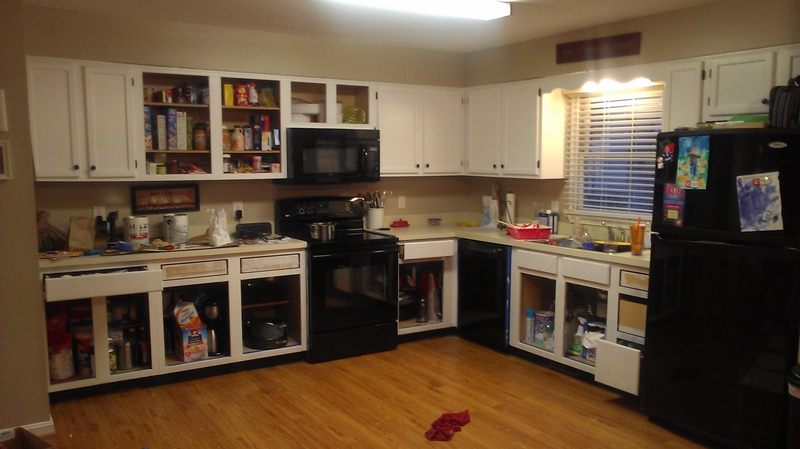 It took us about two weeks to be completely finished, mostly because we had to do life and paint cabinets. We chose dark knobs so we didn’t have to replace hinges. At this point, we picked out counter tops. 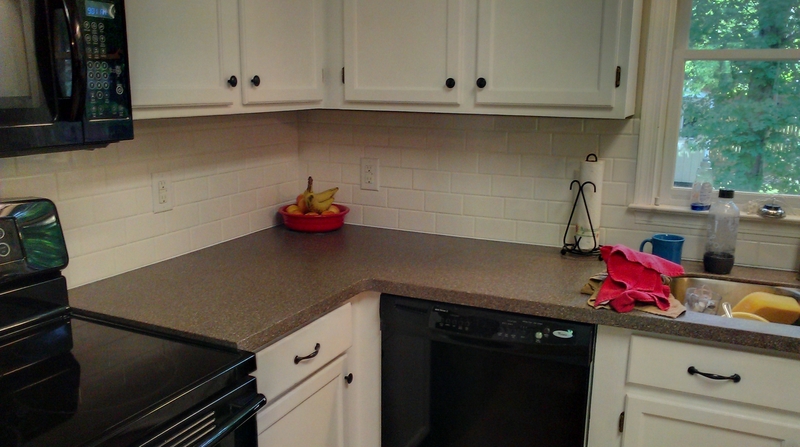 We chose solid surface because it was economical and looked great. It would update the kitchen without breaking the bank. We also decided to not add the lip…the back splash. We also paid to have it installed which was well worth the money. The deal Lowe’s was offering included a free sink! My husband had to plumb it and decided to replace all the piping under the sink because it was crusty. 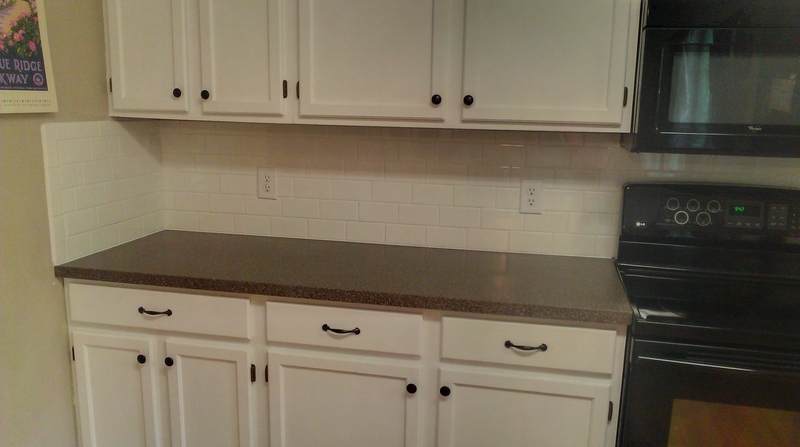 He also put up subway tile as a back splash. The tile was a cheap addition, and with a borrowed wet saw, not terribly hard. Not bad! We have not replaced the flooring yet, but its on the list. Pardon the back pack and various random items. 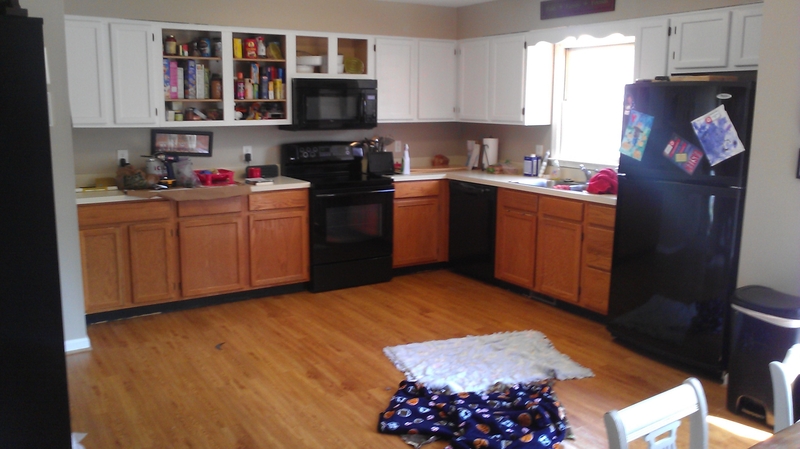 It is almost impossible to get a photo of a 100% clean kitchen with 3 kids!! Here is the price tag. We really worked on one thing at a time. I started painting the first week in March and the tile was finished by the last week of May. The counter tops were the big slow down. We had to wait for someone to measure and then for them to install it. I will warn you in advance, if you don’t want a seam, it will cost you. We never stated we didn’t want a seam and they tried to up-charge us almost $1000. It was their mistake, so they ate it. This project was totally worth the money and saved us $5000.